Russ DiGilio, founder and owner of Duck Donuts Franchising Company LLC, has announced the expansion of his nationally celebrated donut franchise to the college town of Knoxville, Tennessee. The Knoxville location is the first of several franchises slated to open in the Volunteer State. 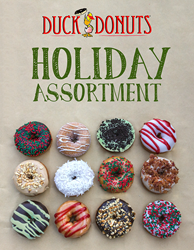 The Duck Donuts Holiday Assortment. A powerful part of our business is job creation, and we’re proud to bring 25 to 40 new jobs with each additional store. We are passionate about spreading our roots in the new communities we are fortunate to call home. Franchise owners—James and Sydney Cummings, Pat and Maria McLaughlin, and Baker and Megan Bell—are eager to introduce Knox County to the award-winning donut franchise that first opened in Duck, North Carolina in 2006. The Knoxville store is projected to open on January 6, 2017, at 6104 Kingston Pike, beside Taziki’s Café. In addition to their “warm, delicious & made to order” donuts, the 1,200-square foot Duck Donuts will feature select retail items, indoor and outdoor seating with the franchise’s iconic beach theme, and a family-friendly atmosphere. “Originally from North Carolina, we are familiar with Duck Donuts and are excited to bring it to Tennessee,” says James Cummings. “We are proud to say that falling in love with our donuts at first bite is the most common path to owning a Duck Donuts franchise. People taste one of our donuts, love the donut-making experience, and decide to bring them to their hometowns. You can’t ask for a more organic growth strategy,” says founder and owner Russ DiGilio. Situated at the crossroads of three interstates and surrounded by seven lakes, Knoxville is a major intersection for the state of Tennessee. It is home to the University of Tennessee, HGTV, over 20 museums, and seven historical houses. In 2015, Knoxville was named in the top five of the 10 Best Cities for Small Businesses by "CNN Money," in "Forbes" on their Best Places for Business and Careers list, and by Livability.com as a Top 100 Best Places to Live. Donuts at this location will be made fresh to order 7 days a week: Monday from 6 a.m. to 3 p.m., Tuesday-Thursday from 6 a.m. to 7 p.m., Friday-Saturday from 6 a.m. to 8 p.m., and Sunday from 8 a.m. to 7 p.m. Visit our Facebook page for updates and connect with us on the web at DuckDonuts.com. By 2011, Duck Donuts had expanded to four Outer Banks locations and the donut business was so successful that DiGilio was continuously approached about franchise opportunities and by fans who begged for a Duck Donuts in their communities. The first franchise opened in Williamsburg, VA, in 2013, and there are now 30 open franchise locations and 126 signed contracts. “We discovered that the most powerful marketing advantage we have is the aroma of warm donuts wafting from every store. Our light vanilla cake donut is a little crispy on the outside and fluffy on the inside, made fresh right in front of you, hand-dipped in hot icing, and sprinkled with your choice of delicious toppings and drizzles. It’s that simple,” says DiGilio. Children love to stand on the strategically placed step in the waiting area, allowing them to see the entire process, as the donut machine cooks and carries their donuts down the line, where they are dipped, topped, packaged, and served warm in the box. Duck Donuts serves its own signature coffee blends—Riptide Roast, Light House Blend, and Sunset Pier Decaf with new special seasonal flavors changing throughout the year—and offers breakfast options, as well as catering services. Indoor and outdoor seating is available at most locations. The featured donut for this holiday season is Mint and is available as a single donut or as part of our Holiday Assortment. To learn more or to share your Duck Donuts experience, Like us on Facebook, follow us on Instagram, or send us a Tweet.